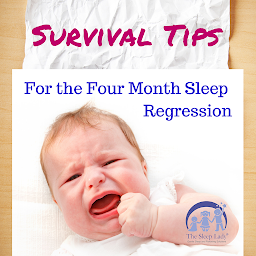 So, you’ve survived your baby’s 4-month sleep regression (or, as I like to call it, the 4-month sleep PROgression, since your baby grows so much during this time!) and emerged with a baby who is engaged with the world around him. You probably noticed this fussy period lasted longer than other developmental phases (at least so far). Actually, from this age on the skills your baby is mastering are more complicated and he’ll take more time to adjust. Studies have shown that at 4-months there are dramatic changes in your baby’s brain waves and a significant increase in his head circumference! After two to three weeks (possibly more, as sleep regressions CAN last as long as six weeks in some rare cases) of “Mr. Grumpy” you are probably questioning if you’ll ever get your smiley, happy, bundle of joy back. The good news? You’re about to! While 4-months is still young to officially sleep coach, there are things that you can do to encourage your baby to get back into better sleep habits in preparation for sleep coaching when he (and you) are ready in a few months. Is my baby ready for sleep coaching? While some babies may be ready for sleep coaching by 4 to 5 months of age, you will find waiting until 6 months will bring you results faster and cause you less frustration. This is because babies usually develop the ability to self-soothe sometime between three and six months of age, and self-soothing is key to becoming a better sleeper. Remember, your baby’s sleep habits are STILL developing, even after all the trials you’ve just gone through with the 4-month sleep regression. I know that having a baby who is up multiple times at night can be frustrating, but rest assured that this phase is very short in the grand scheme of things. The good news is that there are some things that you can do to help your baby get back into better habits that do not involve formal sleep coaching. Remember, your baby is still developing his ability to properly soothe himself back to sleep. Research shows this ability to self-soothe consistently, may not fully develop until 6 months. I know you’re tired, but really, 2 months is a very short amount of time. Enjoy this phase and try some of my suggestions to encourage positive sleep habits for when your baby is ready for sleep coaching. A Note From The Sleep Lady: A small number of babies may be ready to sleep coach after 4-months, but these babies are definitely NOT in the majority. As Andrea has mentioned, the ability to self-soothe often does not develop until close to 6 months, and sleep coaching before your baby has developed this ability will not only be frustrating for you, but also for your baby. I know that you’re anxious to get your baby back who naps and sleeps during the night. At this young age, it is completely normal for your baby to be waking during the night for feedings. So don’t get discouraged if you find your baby who used to be able to sleep a longer stretch all of a sudden wakes and needs a feeding. He’s growing rapidly, and just went through a developmental milestone, so he really DOES need to eat. Soon enough, you will miss those night feedings. No, really! Once you’ve come out of the 4-month sleep regression, you may start to see your baby’s routines reestablished, and your sleeping and feeding schedules are back on track with a baby who is able to enjoy his surroundings. To help encourage this, expose your baby to lots of natural light during the day. Take him for walks, open the windows, or (if it’s warm enough), go have some tummy time on a blanket in the yard. Just 30 minutes in the morning and afternoon will help to re-adjust his internal clock, especially if his sleep was completely upside down. Now that your baby is beginning to understand cause and effect, routines become more meaningful. Establishing a naptime and bedtime routine will help your baby know what is coming up next…sleep! Keep your routines simple, around three activities in the same order every night, one of them being a feed. Some additional bedtime routine ideas would be a massage, story, snuggles, or song. To make matters more interesting, during his developmental leap, your baby has probably discovered all sorts of new tricks, such as grabbing objects and passing them from hand to hand, putting things in his mouth (oh the joy! ), manipulating objects, responding to his name, making new sounds, and maybe even rolling over (although this is considered early, so don’t fret if your baby isn’t there yet). Remember, your baby is learning how to communicate some of his needs. For example: stretching his hands when he wants to be picked up and finding other fun ways to get your attention. You’ll notice his personality is really starting to shine through, and you may notice him gravitate to favorite toys, games, and activities. This is a perfect way to introduce some activity between napping sessions and before bedtime. Your baby has a LOT to explore, so help him by engaging him in play time for 10 to 15 minutes after his feedings to help gently introduce him into the idea that not every feeding ends in a nap (which is true now, but won’t be in a few months). When your baby is ready for bed, make sure that he’s in a quiet, dark room (use a sound machine if he needs a bit of extra help to block out distractions). You want to encourage him to differentiate between daytime and nighttime. You can do this by making where he spends daylight hours bright and cheerful, with lots of things to see and do, and making his bedroom dark in addition to quiet and peaceful to encourage sleep. Try to avoid playing in his bedroom before bed if at all possible. Have I created “Bad” Habits? The 4-month sleep regression is draining. For everyone, including your baby. It’s not surprising that with all these wonderful new discoveries that you may have felt that you created a few so -called “bad” habits. During the 4-month sleep regression, you likely experienced increased night wakings and difficulty at naptimes (if your baby would nap at all! ), you may have relied on methods that work for now but that you definitely do not want to be using for the next couple of years. You know what? That’s ok! Just know you can easily change these things as your baby gets older and is more capable of self-soothing. Don’t worry about creating any “bad” habits at this age. Habits can be changed. As I mentioned before, sleep coaching or behavioral shaping (especially if it involves crying) during 4-5 months could be more challenging because your baby may take up to 6 months to develop the needed skills. Coaching before your child is ready can take longer, cause more crying and may not have long-term effects. If you can wait to sleep coach your baby until 6 months, you are more likely to see long-lasting results, in a shorter period of time with far less crying, if any at all. The absolute best time to teach your baby long-term sleep habits and skills is after his brain and central nervous system have matured which usually takes 6 months. In fact, many books and experts suggest that 6 to 8 months is the perfect window to work gently with your baby to teach him healthy sleep habits and self-soothing skills. For now, focus your energy on making sure that your baby gets adequate sleep for his age. For a baby between 4 and 6 months, that means that your baby should be getting as much sleep as possible. This may mean that your baby takes 4 or 5 naps a day, and that bedtime is just after dinner. Remember, an earlier bedtime will also prevent your baby from going to bed overtired (a problem linked to more difficulties than you may realize!). To make sure that your baby is getting enough sleep, make sure that you pay attention to both his sleepy cues (yawning, eye-rubbing, staring into space, lack of interest, etc. ), as well as his wakefulness windows, which at 4-months is a MAXIMUM of 2 hours. That means your baby may only have the developmental ability to stay awake for an average of 1.5 to 2 hours, and you should be watching for sleepy signs before this so that he doesn’t begin to fuss, which can make it difficult to fall asleep. Watch for sleepy signs. You’ll have a much happier baby. Know that your baby is likely to still need to eat during the night and it’s important to create a sleep friendly environment. During night feedings, make sure that you keep the room quiet, dark, and cause as little disruption as possible. Doing this will gently begin to help him understand that nighttime is for sleep, not play. You may even consider a dream feed before you go to bed. To do this, offer him a feed without completely waking him up and hopefully this will stretch out the time before his next feed. Sleeping longer stretches at night is dependent upon your baby’s ability to soothe himself back to sleep should he wake up during an active sleep phase, You can start to watch for signs of self-soothing as early as 4 months. Knowing your baby’s self-soothing techniques will be helpful in recognizing when your baby is trying to get himself back to sleep. Some examples of self-soothing are: kicking, raising and dropping his legs, rubbing his head back and forth, using an attachment object or lovey, and sucking. It’s not uncommon for babies to have quiet breaks between fussiness as they soothe themselves back to sleep. Please note that fussiness is not the same as crying and you do not need to let your baby cry it out. When you and your baby are ready, you can begin some gentle sleep coaching to help improve things. As you get to know your baby’s sleep patterns, you may find that you can catch him as he cycles into an active sleep phase and gently ease him back to sleep by lightly patting him on his back or with a quiet shushing noise before he fully wakes up. If he wiggles and squirms after you put him down you can use the same methods to help him settle into a deeper sleep. If your baby is responding well to your soothing techniques, you can try using these same techniques at bedtime If you are using a soothing technique, such as patting, and your baby begins to cry, pick him up, cuddle him, and calm him. Doing so now will not create bad sleep habits in the future. Above all, remember that you and your baby are a one of a kind team. Babies will outgrow the need to feed during the night at different ages, and that’s okay. Applying one set of rules to every child will not take into account the emotional or physical needs of your baby. Teething, illness, growth spurts, and developmental milestones will always be there to throw you a curve ball, but you can create a healthy sleep environment and teach your baby self soothing skills that he can use when he’s ready. And finally, remember that some babies (very few) may be ready for sleep coaching after 4-months, but it is definitely not the majority. If you do try these techniques and they just aren’t working, that’s okay. Your baby just isn’t ready. For now, focus on the building blocks that I’ve provided here, and look forward to sleep coaching when your baby is ready. If you do feel that your baby is ready for sleep coaching earlier than 6 months, I strongly suggest that you consult with one of our Gentle Sleep Coaches to determine if your baby is ready to learn to sleep, and if so, will be able to guide you through the process, as sleep coaching a younger baby is quite a bit different than sleep coaching a 6 or 8 month old. Andrea Strang is an Infant Consultant, Gentle Sleep Coach and a Birth Postpartum Doula. In the past 14 years Andrea has helped over 3000 families and has over 10, 000 hours providing in home support with families.